What is the Ecological Footprint of pot? Global Footprint Network tackled that question recently in an analysis of the Ecological Footprint of medical cannabis production in three locations—Colombia, Washington, and Colorado—for PharmaCielo, a Colombian medical cannabis producer headquartered in Canada. 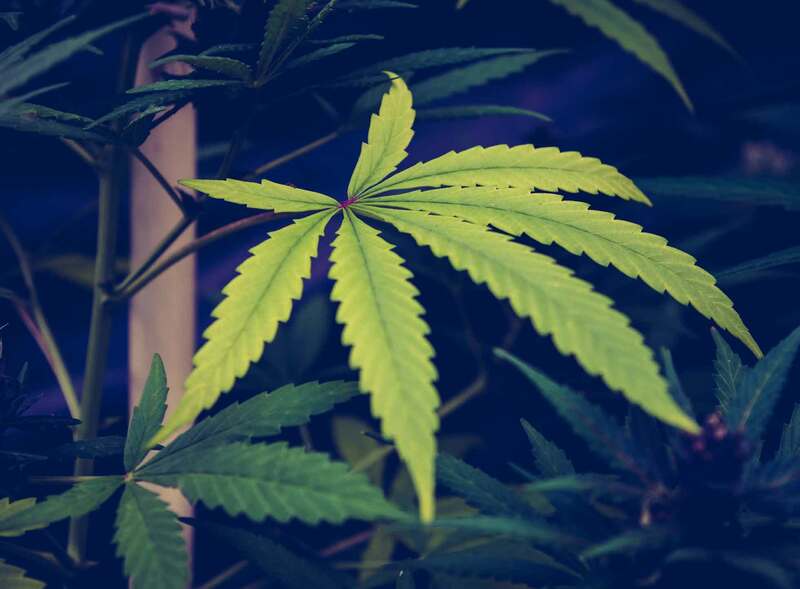 Indeed, Global Footprint Network’s analysis showed that producing one kilogram of dried cannabis flower per year in an open greenhouse in Colombia has a far lower Ecological Footprint than production at sites in Colorado and Washington. The assessment found such production in Colombia takes about 10 global square metres of biologically productive space. (A global square metre is a square meter with world average biological productivity.) About one sixth is occupied by the direct use of space to grow the plants. The rest is needed to provide inputs such as energy, nutrients, building materials, and water. In contrast, the closed, artificially lit warehouses in Colorado require 3,700 square metres of biologically productive space to produce one kilogram of dried cannabis flower per year. The warehouse uses about the same direct area for growing plants as the open greenhouse. But the warehouse is far more input dependent, with electricity making up the bulk of this Footprint. Most of the energy is required for lighting. Compared to the other two examples, the Washington state production has relatively high use of access surfaces, leading to a larger direct crop Footprint than the other two operations. But compared to the indoor production, the energy consumption is dramatically lower. Still, the energy consumption represents over half of the production’s demand on biocapacity. The figure below provides a graphical comparison of the largest and smallest Footprint per unit of production. 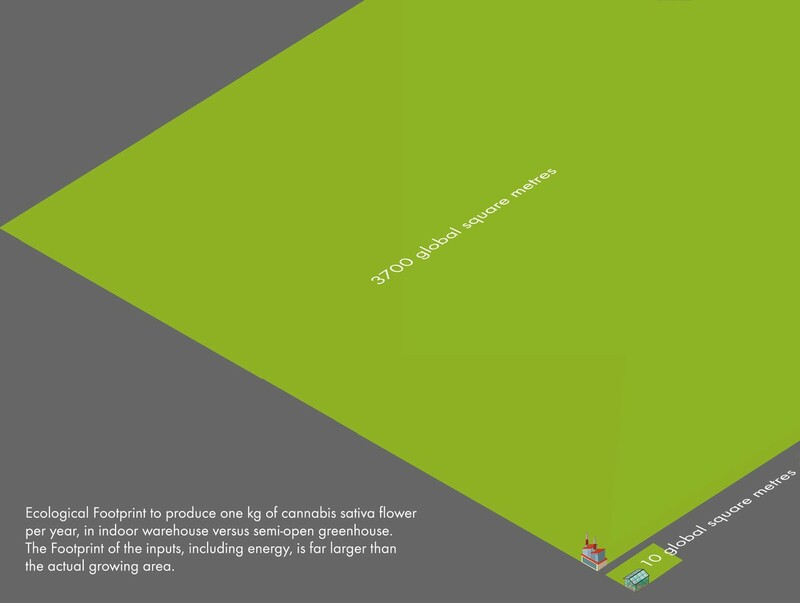 The difference is so large that on the graph, the size of the larger field can only be inferred through its proportions, as it exceeds the graphical space and dwarfs the smallest Footprint option—open greenhouse production in Colombia. Open greenhouse (Colombia) versus indoor warehouse production (Colorado) per annual kg of dry cannabis sativa flower. Assume that the larger field has the same proportions as the smaller field to get a sense how much bigger the Ecological Footprint demand of the warehouse production is compared to the open field production. But even for the open greenhouse production, demands for additional inputs exceed by one order of magnitude the direct use of space for growing.